If you’re after a healthy-alternative to thick-cut, carb-filled oven chips, look no further. 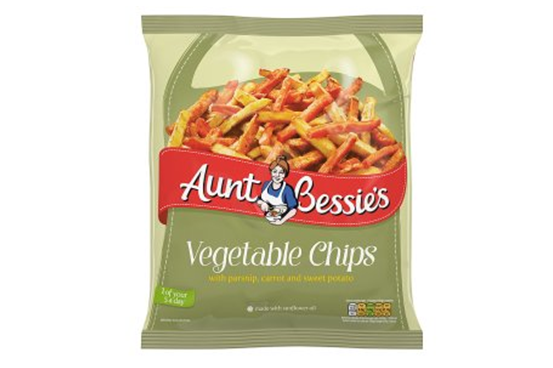 Aunt Bessie’s have launched Vegetable Chips, now available in Waitrose stores, for a price tag of £2.79 per 500g bag. The chips are set to be sold in other stores including Tesco, Asda, Sainsbury’s and Morrisons in the coming months. Following the successful launch of frozen Sweet Potato Chips from the freezer-favourite last spring, they’ve launched this exciting new product in which a serving gives you one of your 5-a-day. The chips consist of cut carrots, parsnips and sweet potato, the product’s target market being the increasing UK population concerned about increasing their veg, and lowering their carb intake. They’re suitable for vegetarians; however they may contain allergens such as eggs, gluten and milk. They take just 20 minutes in the oven for a great alternative to chips or potatoes. Aunt Bessie’s marketing director Lorraine Rothwell says that the vegetables are UK sourced where possible, dependant on availability and demand, and that the launch is in response to modern food diets and preferences wanting to low-carb options. She tells trade magazine The Grocer, “We’re always looking to develop something new for shoppers to try and our research showed a real opportunity for branded frozen Vegetable Chips – in fact we’re the first to bring frozen Vegetable Chips to the market. The Sun reports that many feel frozen veg isn’t as nutritious as fresh, however research shows that the nutritional differences are small, with both options great for you. Live Strong reports how frozen veg is a perfect way to get nutrition when your preferred fruit and veg choices are out of season. The freezing process may slightly alter vitamin content, however ‘vegetables that are intended for freezing are harvested at their peak of ripeness, which allows them to retain their nutrients during the freezing process’, Live Strong continues. It’s important to note however, that the nutritional value changes due to freezing and cooking techniques do depend on the vegetable. Choosing frozen is beneficial in that it’s convenient while still stocked full of goodness, as well as being a cheaper option - being around £260 cheaper per year than fresh food, as reported by The Sun in January. It’s expected that other frozen food brands will follow Aunt Bessie’s lead in order to appeal to a wider market looking for healthy options.